Taliban guerrillas riding a fleet of vehicles shot up a government office in southern Afghanistan overnight, killing four Afghan soldiers and losing one of their own, an official said Sunday. The attack came within hours of an explosion which killed four U.S. special forces traveling in a Humvee, one of the deadliest setbacks for American troops trying to stop resurgent militants from wrecking planned national elections. The suspected Taliban swept into Musa Qala, a market town 150 miles southwest of the capital, Kabul, late Saturday, opening fire on the government office with assault rifles and heavy machine-guns, mayor Mullah Amir Aghunzada told The Associated Press. Four of the 30 soldiers defending the compound were killed and eight others wounded, Aghunzada said. One Taliban fighter was also killed and four captured, three of them wounded. The official said about 100 Afghan troops rushed from the provincial capital Lashkargah and began combing the area for the attackers Sunday. "There is some support for them in this area," Aghunzada said. "They live up in the mountains and come down at night." 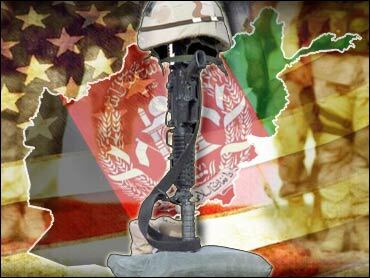 The four American special forces perished Saturday about 20 miles east of Qalat, the capital of southeastern Zabul province. "An explosive device detonated under the (Humvee) the four were traveling in," spokeswoman Lt. Col. Michele DeWerth said. The toll was one of the worst for a single attack on the U.S.-led coalition force, which currently numbers a record 20,000, since it entered Afghanistan to topple the Taliban for harboring al Qaeda leader Osama bin Laden in late 2001. DeWerth gave no more details. An Afghan government official told AP that the Humvee hit a mine in Zabul's mountainous Sorie district. The official, who spoke on condition of anonymity, said three more Americans were wounded in the blast. At least 89 American service personnel have died in and around Afghanistan since the start of the U.S. war on terrorism following the Sept. 11 attacks, including 55 killed in action. But the vast majority of the 360 people killed in violence across Afghanistan this year are Afghan soldiers and civilians. Some of the violence is blamed on drug-smugglers and feuding warlords, who still control much of the country. But much is also down to militants bent on disrupting the country's first post-Taliban elections slated for September. The United Nations and Afghan officials have so far registered some 2.7 million of the estimated 10 million Afghans eligible to vote. But poor security means they have been unable to enter rural areas in much of the south and east. The U.S. military has insisted the vote can go ahead and announced Saturday that thousands of U.S.-trained troops from the new Afghan National Army will fan out across the country to help 20,000 German-trained police provide security. NATO-led peacekeepers are also expected to expand north from Kabul in time for the vote. The 6,400-strong force took delivery Sunday of three Turkish Black Hawk helicopters to ease its shortage of equipment. A United Nations spokesman said registration would pick up pace, despite the likelihood of attacks on election workers. "There are those who want to spoil this," spokesman Manoel de Almeida e Silva said. "However, voter registration must happen throughout the country." Separately, the U.S. Arny said Saturday that it was "probably friendly fire that killed Pat Tillman as he led his team of Army Rangers up a hill during a firefight in Afghanistan last month. Tillman walked away from a $3.6 million NFL contract to join the Army after the Sept. 11, 2001, attacks. The Arizona Cardinal safety became a symbol of patriotism to many Americans for his decision.